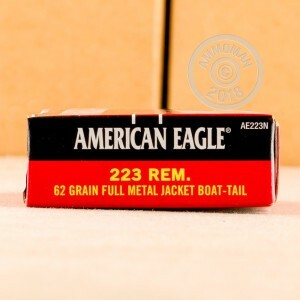 The 223 Remington is one of the best rounds in the world. When it came out in 1964, this round soon became one of the most widely used rounds around the globe. Due to its small size, light weight, high accuracy, and extremely low recoil, the 223 Remington is ideal for both military and civilian purposes, including hunting and match shooting. 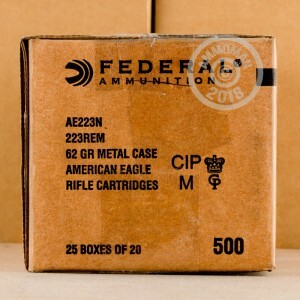 With the quality and low price that is Federal American Eagle, you can't go wrong with these super accurate range training, plinking, and 3-Gun rounds. These full metal jacket boat tail rounds have higher accuracy and range, as well as a flatter trajectory than normal rounds. 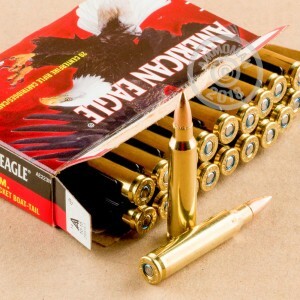 When you pop these 62 grain rounds into your favorite rifle, you are in for a treat.